Cabbage makes a healthful addition to your diet, because it's rich in nutrients and low in calories. Eating cooked cabbage may be preferable to raw, as cooked cabbage is softer with a more mellow flavor. If you're trying to lose weight, cooked cabbage can be a wise choice due to the low fat content and high fiber content. Cooked cabbage is very low in calories -- a half-cup serving provides only 17 calories. This amount comprises less than 1 percent of the daily recommended intake of 2,000. It also contains just 0.1 gram of fat per serving. If you're dieting, you can burn off the 17 calories in your serving of cooked cabbage in less than five minutes of weightlifting or less than three minutes of low-impact aerobics. Cooked cabbage contains just 4 grams of carbohydrates per half-cup serving, so it can be suitable for a low-carbohydrate meal plan. Of those 4 grams. 1.4 come from dietary fiber, a type of carb that promotes digestive health, aids in managing your blood sugar levels and provides feelings of satiety. Other carbohydrates provide your body with energy, but you may find that restricting your carbohydrate intake can help you lose weight, if you reduce your calorie intake as well. Cooked cabbage helps you consume more vitamins C and K. Each serving provides 28 milligrams of vitamin C -- 37 percent of the recommended daily intake for women -- and 82 micrograms of vitamin K, or 91 percent of the daily intake recommended for women. Both of the vitamins promote healthy bones. 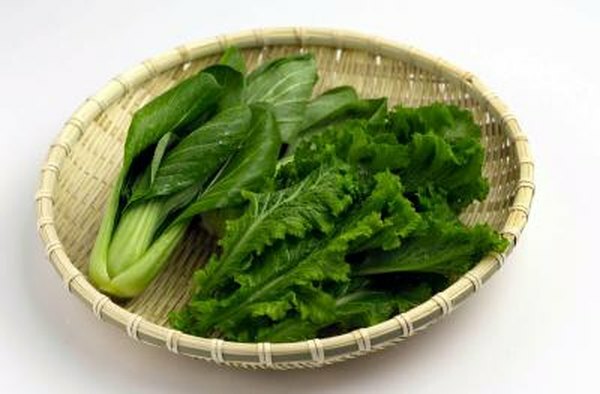 Vitamin K also helps you form blood clots, while vitamin C helps your body metabolize calcium. Eat cooked cabbage as a source of essential minerals, including calcium and potassium. Calcium's best-known benefit is improved bone health and a lower risk of osteoporosis, but it also offers other health benefits -- it promotes nerve function, helps your muscles contract, and plays a role in cell communication. Potassium also aids in nerve and muscle function, and it also helps control your blood pressure. A serving of cooked cabbage contains 36 milligrams of calcium and 147 milligrams of potassium -- 4 and 3 percent of your recommended daily intakes, respectively.